Rafferty is an excellent RDA Pony. He is intelligent, obedient, forward going and very tolerant. 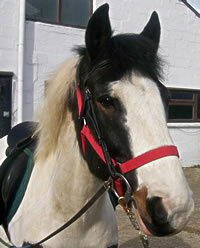 He is a lightweight piebald cob of 14hh who is quick to learn and is particularly good to use with our electronic hoist for wheelchair bound riders. He was bought for us by Seafare Fish and Chips of Cranleigh in 2007.